This great contemporary 5-string electric bass guitar features a compact, contoured alder body with a bolted deep cut joint to a maple neck. The 2-octave, 24-fret rosewood fingerboard and ultra-compact headstock is fitted with 5 closed geared tuners. The single coil and split humbucking pickups are controlled by 2 volumes and an overall tone. 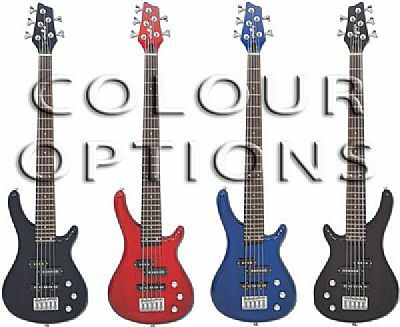 The Chord CCB95 left handed 5 string bass guitar - ideal for a wide range of modern genres and playing styles requiring extended range down to low B. Construction: Contoured body, extended bolt-on neck. Pickups: Oversize - 1 single coil, 1 split coil. Controls: 2 volume, 1 tone. Dimensions: 315 x 1180 x 60mm. Right handed versions available: Black, Red or Blue. Black ABS case with aluminium location strips to give extra rigidity and strength, Internal accessory compartment. Chrome catches (1 lockable, key supplied) and hinges with a black plastic handle.